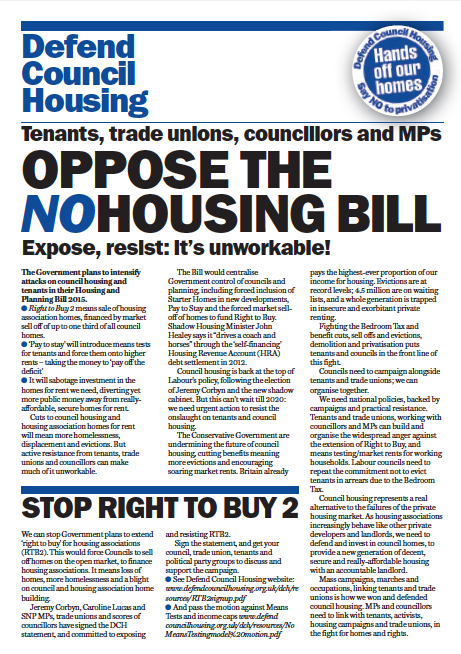 As part of a joint campaign, Defend Council Housing and Architects for Social Housing are organising a protest outside Parliament at 1300 on 05 January 2016 to coincide with the Third Reading of the Housing and Planning Bill in the House of Commons before it progresses on the the Lords. The current progress of the Bill is laid out here. This legislation is a critical threat to housing in this country. 1. Significantly reduce the future supply of genuinely affordable rented homes by redirecting government support to private developers building publicly subsidised ‘Starter Homes’ that may help a few, at the expense of worsen the prospects for millions in housing need. 2. Further erode the stock of affordable rented homes by compelling Councils to sell-off ‘high value’ homes when they become empty. 3. Require cash-strapped Councils to pay a levy to cash-rich Private Registered Providers (housing associations) to subsidise Right to Buy discounts with no prospect or guarantee of replacement homes for rent in the same areas. 4. Introduce means testing for Council and HA tenants and make them ‘Pay to Stay’ in their homes by charging near-to or full market rents if household income is above £30,000 (£40,000 in London). Social housing tenants are not ‘subsidised’ – this is an unjustified tax on working households, a disincentive to increase earnings, and makes many feel stigmatised. It will be costly to administrate, increase conflict between council landlords, staff and tenants, and is likely to result in people disappearing from tenancy and electoral records. 5. Attack the rights of Gypsies and Travellers through a discriminatory reduction of available housing sites. 6. Provide only a fig-leaf of protection to private renters facing soaring rents, insecurity, disrepair and the constant threat of eviction. 7. In a bombshell late amendment at the start of Report stage, Government is now proposing to abolish life-time Secure Tenancies. This will compound the destabilising of mixed communities, further undermine Council housing as an alternative to market housing, push more households into unsuitable private renting and feed into the rise in housing costs, eviction rates and housing benefit. It breaks a series of undertakings made to tenants since Secure Tenancies were introduced in 1980. The net effect of the Bill would fundamentally change the housing landscape of the UK and do nothing to solve the housing crisis. 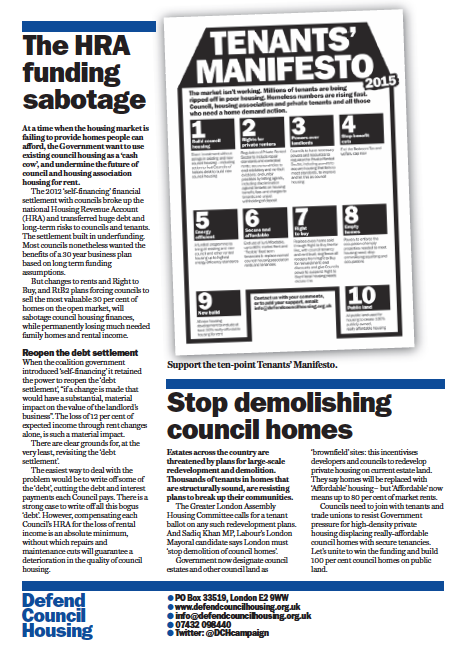 I am part of a national campaign of tenants from all tenures, tenant organisations, councillors. 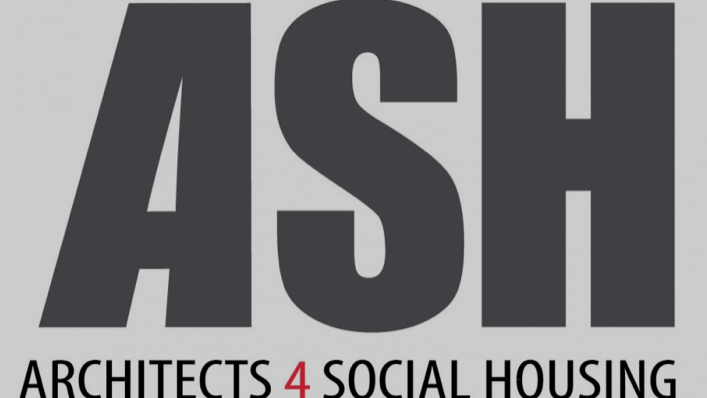 MPs and trade unions which is growing fast, to ‘Kill the Housing Bill – secure homes for all’. A protest will be taking place outside parliament on 5th January (from 1pm) and a meeting on the same day in parliament: you would be welcome to come along. Please let me know what you think about the Housing and Planning Bill and what, if any, action you are taking to address the concerns listed above? I agree that we are facing a housing crisis in this country. Over the last five years there has been the lowest level of home building since the 1920s, and home ownership has fallen every year since 2010, declining by more than 200,000. The gap between the number of homes being built each year and the number of homes people need is unprecedented – over 100,000 each year. Last year, the Government oversaw the building of the fewest affordable homes for more than two decades – fewer than 11,000 homes for social rent, compared with 33,000 in Labour’s last year in Government. Spending on housing benefit has risen by £4.4 billion since 2010, because of ever-increasing rents, and there has been a 36% rise in homelessness and a massive rise in rough sleeping. The last Labour Government had a proud record in this area. Between 1997 and 2010, the number of home-owning households increased by 1 million, almost 2 million homes were built, and the Labour Government launched the biggest social and council house building programme in a generation in the final days of government. As the Chancellor showed in his recent Spending Review, the Government has no plan to address the major challenge of how to build the affordable homes to rent and buy that we need. Their Housing and Planning Bill will lead to a huge loss of affordable homes when they have never been needed more, and the government’s proposed solution of ‘Starter Homes’ simply won’t help most young people and families on ordinary incomes – by 2020 the average Starter Home in England could require an income of £50,000 and a deposit of £40,000. As part of the Opposition’s response to the severe housing problems our country faces, my colleague John Healey – the Shadow Cabinet Minister for Housing – has launched an independent review into home ownership, to look at the root causes of the decline in home ownership, and set out new ideas needed for a wide debate on the topic. John has also set out how 100,000 council and housing association homes a year could be built, paid for through housing benefit savings. The Government now needs to listen to the widespread concern regarding the housing crisis. I have now written to the Department for Communities and Local Government about the issue you raised. As soon as I receive a reply I will contact you again. Thank you once again for writing to me and sharing your views. I assure you that I will continue to bear them in mind as these issues are debated in Parliament. Thank you for your e-mail of 29 December which raised several points about the Housing and Planning Bill currently before Parliament. Supporting home ownership is one of the Government’s key priorities, which is why we promised to extend the Right To Buy to the tenants of housing associations. The voluntary agreement with housing associations and the National Housing Federation will enable many more tenants to achieve their aspiration to own their own home. The emphasis in the agreement on every home sold being through new supply nationally will support our wider ambition to deliver one million new homes. We are pleased that the housing association sector has agreed to work closely with us on the implementation of the voluntary agreement, and we welcome the participation of five housing associations (covering 24 local authorities) in the six month pilot scheme. With reference to the sale of high value assets, at a time of increased need for housing across the country, it makes no sense for a local authority to keep hold of high value vacant dwellings. Selling such properties will help to increase the overall housing supply as well as supporting housing association tenants to buy their property. That is why we are legislating to require local authorities to make annual payments in line with the anticipated receipts from the sale of their high value vacant council housing. We will set out more detail on this in due course. The Government is keen to ensure the best use is made of social housing – that housing support is focussed on helping those in need, and that those social tenants on higher incomes make a fair contribution. The Government is therefore introducing a mandatory “Pay To Stay” policy for local authorities, which builds on the current voluntary policy that allows social landlords to charge higher rents to social households. The policy will be voluntary for housing associations. We are currently considering the consultation responses on other aspects of the Pay To Stay policy and will respond in due course. We have also introduced measures in the Housing and Planning Bill designed to crack down on the small minority of rogue and criminal landlords who exploit their tenants by renting out unsafe and substandard accommodation, often to vulnerable tenants. We are helping tenants who want a longer tenancy through our Model Tenancy Agreement, and we introduced legislation last year to protect tenants from eviction when they raise a complaint about the condition of their home. With regard to Starter Homes, the Bill gives the Secretary of State the power to make regulations requiring local planning authorities to grant planning permission for specific residential development if a ‘Starter Home’ requirement is met. We want to see a degree of flexibility with the requirement, to reflect the different nature of residential development and viability pressures across the country. Once in place, local planning authorities will need to apply their plan policies, including those on affordable housing, in the light of the statutory Starter Homes requirement. Where it would be viable they can also seek other forms of affordable housing, such as social rent. Finally, the provisions in the Bill do not seek to remove the obligation to assess the accommodation needs of Gypsies and Travellers. Rather, the aim of the clause is to simplify legislation to ensure the housing needs of all residents anf those resorting to the area are considered without specific definition of certain groups, whilst still considering the special accommodation needs of the whole community. Thank you for your letter of 11 January to the Rt Hon Greg Clark MP, enclosing correspondence from your constituent Cllr Paul Bull regarding the Housing and Planning Bill. I am replying as Minister for Housing and Planning. Cllr Bull wrote to me on 29 December last year outlining his concerns on the Bill. Earlier this month I was able to respond to him directly addressing these issues, and I attach a copy of my reply for your attention. Cllr Bull also had questions about the changes to lifetime tenancy arrangements, proposed through the Bill, which I do not believe were covered in my earlier response. The Government is keen to ensure the use is made of social housing. This means that social tenancies are given to those who need them most for the period of their need, rather than simply given to people for life respective of how their circumstances change in the future. The changes we are introducing through the Housing and Planning Bill will require councils in future, with limited exceptions, to grant tenancies with a fixed term of between 2 and 5 years, and carry out a review of the tenant’s circumstances at the end of the fixed term to determine whether there is a continuing need for social housing – rather than provide this on an automatic lifetime basis. These changes are aimed at ensuring that social housing is focussed on those who need it the most, for as long as they need it; that those who need long term support are provided with more appropriate tenancies as their needs change over time; and that households are supported to make transition into home ownership where they can. They will not take away security of tenure from existing lifetime tenants who remain in their home. Those who are moved by their landlord – for example, as part of estate regeneration – will also retain their lifetime tenancy. Where lifetime tenants chose to move, councils will have a limited discretion to offer further lifetime tenancies. We would expect this to include, for example, where tenants downsize to a smaller property, or where they move for work.